Visiting a museum can be fun, it can be exciting, but for these guys it was boring – and extremely much so. Street photos generally have little text to them so I’ll let you imagine the words that go with this photo. All I’ll say is that about the dodgy quality, yes I know it’s shaky, it’s not tack sharp, it’s lots of things far from a perfect shot. But what I like about this shot is moment it captures, I tried to re-shoot it at the time but the couple got up and left. So this is street photo at it’s best. Capturing a unique moment of emotion that will probably not repeat itself again. To me that’s what street photography is all about. I admire those that do it well, and I attempt to do it as good as them. This was taken in the Victoria and Albert museum in London a while ago but I just never posted it because it’s blurry, now looking over it again I think it’s worth posting blurry or not. If you don’t know what you’re going into then put your camera on automatic. Otherwise try to keep setting like this Aperture 5.6, Iso 400 outside 800 inside and put it on aperture mode. Then of course keep your lens-cap off and have your camera out of it’s bag. If you’re going to be in dark spaces well then pump up the iso and try to recover the noise with a noise removal software. Street shots are from the hip, they’ve got to be quick and you need to be in-your-face about it. 29 Jul	This entry was published on July 29, 2011 at 7:34 pm. It’s filed under black and white, Canon 500D, London, non-HDR, People, photography, Street photography and tagged bored, Canon 500D, London, London. 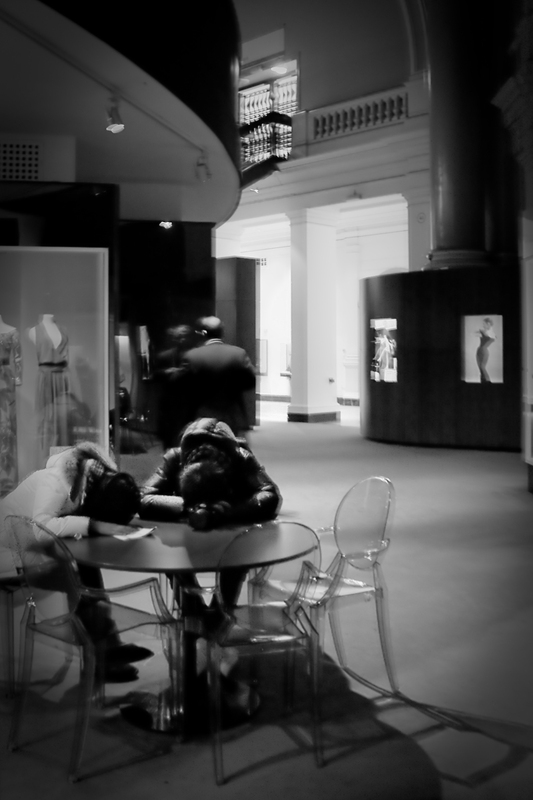 Victoria and Albert museum, non-HDR, photography, photos, street photography. Bookmark the permalink. Follow any comments here with the RSS feed for this post.